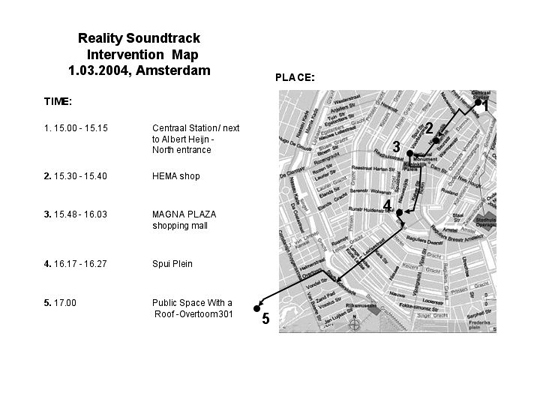 Reality Soundtrack is sound intervention in public spaces as post offices, passages, shopping malls, streets. Sound carriers are people equipped with small radio receivers – 25 or more people, each one having 1 radio receiver. All these radio receivers transmit the same electronic composition, which is transmitted from a short range radio station, or even better, from an existing radio station. All the participants - carriers are walking together through parts of a city following given Intervention Map. The audible result of the action is a moving cloud of sound, which is traveling through a city. The duration of the intervention is flexible, best around 2 hours in the afternoon time. The goal of the intervention is to transpose a real situation in public space onto a plane of fictionality. The sound intervention alters the mode of perception of a random passer-by listener. That which a listener sees becomes a fiction and support for that which he or she hears. The result of such alienation is that the listener no longer perceives reality as something that has any immediate effect on his or her own existence but, rather, accepts it as an aesthetic phenomenon; this, however, may present a direct threat to his or her own existence. Installation consists of a big - 5.5 m (length) x 4.5 m (height) Reality Soundtrack Instruction Score on a wall. In front of the wall, there is small radio transmitter with antenna that is transmitting Reality Soundtrack. 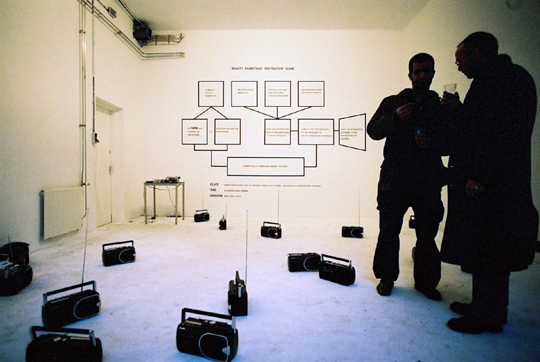 On the floor, there are 25 radio receivers scattered around, transmitting the sound in moderate loudness.